I recently ran a workshop exploring worldviews. We began by discussing and defining our worldview as Christians, being careful do describe it in a way that is distinctly and uniquely Christian. Later, we explored the Islamic worldview, based on information gleaned from Muslim websites, chats with Muslims, and verses from the Quran that were quoted by Muslims to support their views. Each worldview is broken down into eight key areas, based on James Sire’s worldview questions in his book ‘The Universe Next Door’. 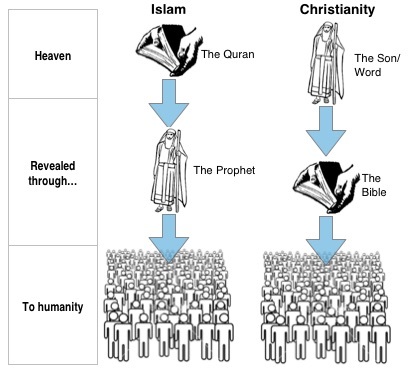 You will see that, while there are some areas of connection between Christianity and Islam, in reality they are worlds apart. Any notion that they are essentially the same at heart is ignorant at best and deception at worst. Nevertheless, the few points of connection should be seen as open doors – opportunities to engage with our Muslim friends and neighbours to begin a conversation that can lead to speaking the Gospel. A good way to start such conversations is to ask lots of questions – genuine questions. Actually be interested to know who they are, what they believe, and what they value. In other words, love them. This post is by no means an exhaustive summary of Muslim beliefs, and just as in Christendom, there will be a diversity of beliefs and emphases depending on the background of the Muslim person you are speaking to. So take the time to learn and appreciate and understand and respect, instead of going straight for the jugular. The Muslim worldview, way above many others, provides great opportunities for us to talk about things that really matter. What is the foundation of all reality? God, who is Triune: One God eternally existing in in three persons, united in Love. God is personal, relational and very close to all people, and He wants people to be in relationship with Himself. Love is at the heart of His character, and all He does is in love. Truth: Can it be known – and if so, how? We can know the truth. It is a gift from God; revealed to us by the Holy Spirit, not dependant upon our ability or intelligence. The full, final revelation of the truth of God is found in Jesus, who is the way, the truth and the life. The physical world was created by God, and is under His authority. It was made good and with purpose, but is now flawed, being under the curse of sin; and it is awaiting renewal that will take place when Jesus returns. God values creation so much that He was willing to enter into it in the person of Jesus. We are made In God’s image: designed to be sons of God, to rule and care for creation, and to be part of God’s plan for the whole universe. Ultimately we exist for God’s glory. True humanity is exemplified in Jesus, however we are is sinful, needing salvation. The human story: What’s the point? God is overseeing and controlling human history, ensuring that it fulfils His purposes. All that God is doing in human history is with the aim that people will come to know Him. History will culminate in every nation acknowledging Jesus Christ as Lord. Mortality: What happens after death? Human beings die once, after which they will face judgement. At this judgement they will either be condemned or vindicated, depending on their relationship to Jesus Christ. After death all people will continue to exist forever, either in the loving presence of God or separated from His favour. Morality: How do we know how we should live? God reveals what is good and evil through His commands, which are recoded in ‘hard copy’ in the Bible. All humans have a conscience, which is flawed by sin, but for those in Christ the conscience is renewed through the work of the Holy Spirit. Jesus shows us true and right human living. Convictions: What personal, life-orienting core commitments flow from all this? Knowing all this gives us the conviction to live in a right way, in the power of God’s grace, with a desire to honour and love God and love our neighbour. What drives us is the sure hope that we have in God’s promises about our future, and the call to proclaim the Gospel in the whole world. Jesus Christ is at the centre of everything, and our supreme goal is to glorify Him. Allah, the Creator and sustainer of all. Allah cannot be associated or connected with anything human or created. Only by revelation from Allah. Ultimate truth is in the Quran, given through Mohammed. Created by Allah. We cannot know the reason for creation, but must glorify Allah for it. There are seven ‘heavens’ (containing paradise) and seven ‘earths’ (containing hell). Above all is Allah’s throne. For all to come to a knowledge of and submission (salaam) to Allah, in an islamic society governed by sharia law. The course of history is determined by humanity, under Allah’s guidance. History will culminate in the day of judgement. Every human being will be judged based on their balance of good works and bad works. Belief in Allah as the one true God. Belief in angels as the instruments of God’s will. Belief in the four inspired books: Torah, Psalms, Gospel, and Quran, of which the Quran is the final and most complete. Belief in the twenty-eight prophets of Allah, of whom Muhammad is the last. Belief in a final day of judgment. Confession: There is no God but Allah and Muhammad is his prophet. Fascinating. Thanks again for your thoughts and words James. Keep it up. Where do you fit on the DUNA Grid?